Whether you call yourself a fan or not, anyone who takes an interest in cinema has heard of Michael Bay. CE Pro Eu can see you picturing nuclear-level explosions and impossibly glamorous woman in various disaster scenarios now; in short, he gives his following what they want. You only need glance at his films’ box office results to see that this is a man who knows what he’s doing, so he probably isn’t too concerned that you didn’t care for Transformers: Age of Extinction – it made over US$1 billion. 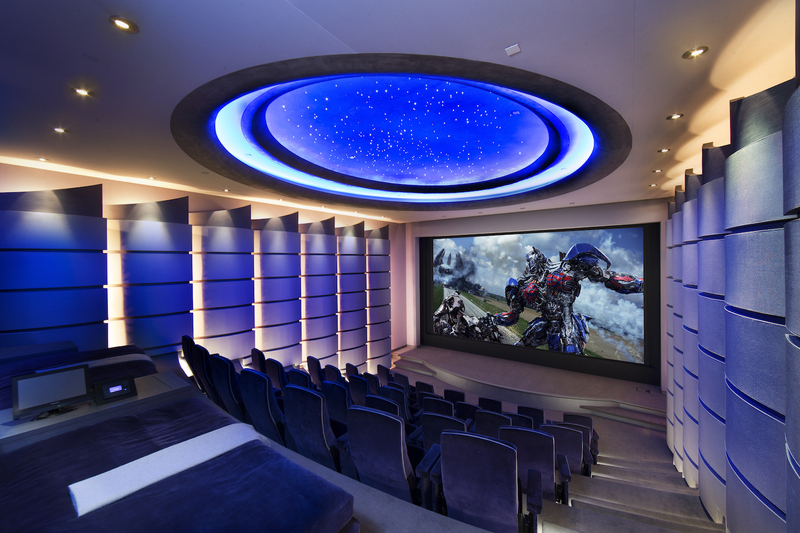 Naturally, the director is a huge cinephile with a penchant for premium-grade film technology, so when constructing his new East Gate Bel Air, California property he knew that nothing less than a home cinema to rival all others would do. It just so happens that Michael is a long time advocate of Barco, having relied upon the projector manufacturer’s handling of details, sharpness and colour for years. As the director desired a 25-foot screen, a Barco Ultra-Bright 4K DLP projector was chosen to fit the bill, providing the brightness, contrast and picture-perfect colour required. “Brightness is the key for our eyes to see colour and detail – especially with 3D – and this is where Barco really excels,” he reasons. The Barco projector occupies a new 40+-seat home theatre secured behind a solid sculptured steel door, nestled within a hidden moss tree garden, and was specially tuned for Michael’s home cinema in order to achieve the best possible image quality. “Picture quality was of primordial importance and that’s where we came in,” Tim Sinnaeve, managing director for high-end residential at Barco, tells CE Pro Europe. “He was expecting nothing less than the best image quality available on the planet today, with particular focus on stunning brightness, excellent contrast and picture-perfect colour. Let’s start with the cinema – and what a home cinema it is. Michael worked with renowned theatre architect and acoustical engineer, Jeff Cooper of Jeff Cooper Architects Inc for the conception of the theatre to ensure that all aspects met his expectations. An area that can only be described as a ‘prop room’ can be found before the theatre entrance, kitted out with all things Michael Bay, including – of course – the vintage Camaro/Bumblebee from the Transformers series. “He paid for the house, so he gets pride of place,” the director smiles. The auditorium is in stark contrast to the ultra-modern home, exuding a more understated, old movie house feel with art deco flourishes and a huge dome sprinkled with twinkle-fibre optic stars. “This was a detail that I grew up with as a kid in the old Los Angeles grand movie theatres, so I wanted to create that feeling here,” Michael explains. The theatre – which incidentally is the first private Dolby Atmos theatre in Los Angeles – boasts steeply inclined rows of curved stadium seating in order to maximise sight lines and assure optimum hearing lines. By sculpting the rows in this manner, maximum screen size was achieved for overall dramatic impact. The medium back rocker seats are upholstered in purple mohair, custom manufactured by Irwin Seating. “Due to the excellent sight lines, every seat in the house is a great seat,’ says Jeff. Naturally, the screen in enormous. The Stewart Filmscreen 12 foot high by 24 foot wide monster conceals five front speakers and two subwoofers that are mounted directly behind it for accurate acoustic imaging. The Microperf screen contains thousands of micro perforations to enable acoustic transparency, coupled with the highest quality video image. 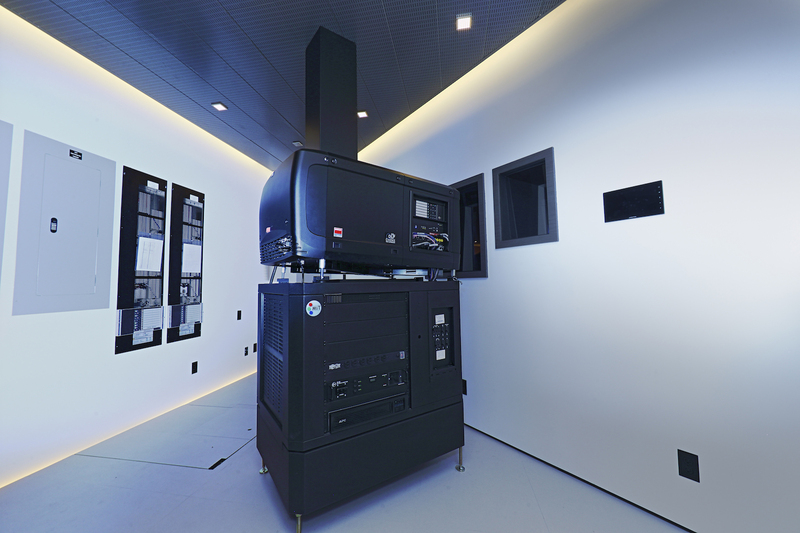 Not forgetting the Barco 4K digital video projector mounted in the projection/machine room directly behind. “Even for a high end luxury home theatre, the screen size is exceptionally large at 24 feet,” Tim admits. The Barco projector was more than up to the task however, and was able to meet that challenge without compromise. The theatre itself is built to the highest digital standards and is DCI compliant. 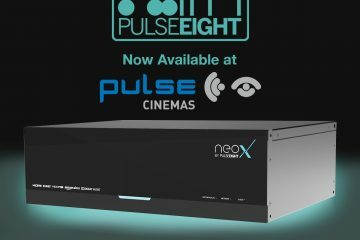 “This means that released and unreleased studio films can be stored in various technical formats (Dolby 5.1, 7.1 and Atmos) and played back on demand via the encrypted hard drive, which is rack-mounted in the projection/machine room,” Jeff explains. The Dolby Atmos theatre is home to 25 powerful speakers and independent channels of amplification. “The stereo imagery and bass levels in the room are astounding,” says Jeff. QSC was selected to provide the sound system behind the screen, comprising five full range three-way speakers and two subwoofers. The surround system is made up of 18 JBL speakers hidden in the side walls, rear wall and in the ceiling. 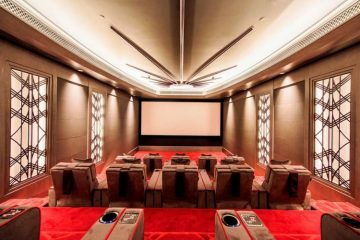 “The sound and video system is integrated with the owner’s editing suites and post-production facilities to enable viewing of dailies and in-progress film production,” he points out. Synergy Group, Inc, an affiliate of Jeff Cooper Architects, Inc, installed the video projection and Dolby Atmos digital sound system. “The acoustics are controlled by a specially designed system of curved acoustical diffusers created by the theatre architect,” Jeff explains. These shapes also contain bass traps to provide maximum low-end ‘punch’ throughout the theatre. “Superb acoustic clarity is maintained in every audible frequency range at every seat,” he insists. What’s a top of the range home cinema without a star domed ceiling? This was another request of the director, leading to the implementation of a 20-foot elliptical star dome, constructed using Swiss-engineered acoustical plaster manufactured by BASWAphon North America. “The perimeter of the star dome is illuminated with concealed coloured changing LEDs to produce different sky effects, such as dusk or sunrise,” says Jeff. And when the mood strikes, various constellations and star patterns can be remotely programmed and triggered to synchronise with music. Eagle eyed astrologers will notice that the main star pattern is based on a computer-aided mapping of the Aquarius constellation. As a market leader in digital cinema, Barco is currently working on many new initiatives, some of which involve working with renowned film directors such as Michael Bay, but this didn’t mean the project wasn’t daunting. “It’s not every day that you get to work on a home theatre project for a Hollywood director of Mr Bay’s stature,” Tim admits. 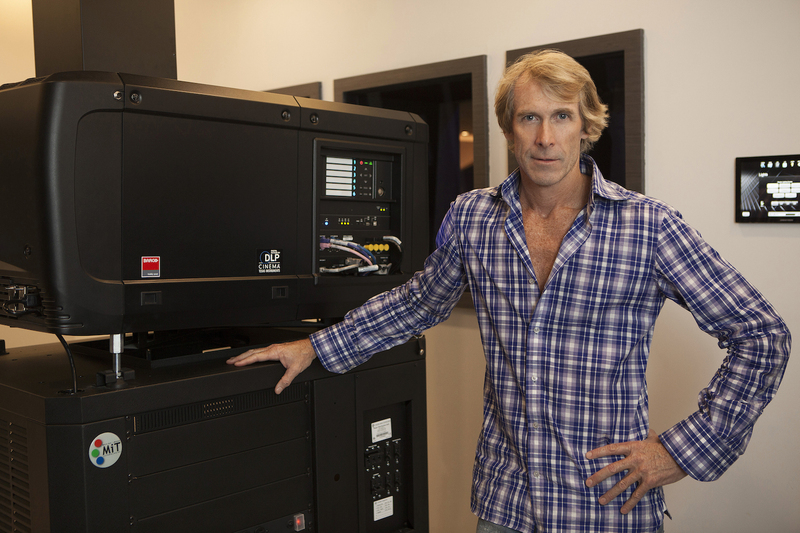 “That being said, anyone would feel pressure when working on a home theatre for a movie director of Michael Bay’s stature, who has directed and produced movies that have grossed $6.5 billion worldwide!” Tim exclaims. Judging by Michael’s comment that he now owns “one of the very best home theatres in the world” and the fact that the cinema wowed Steven Spielberg upon visiting, Tim has nothing to worry about. Tim explains that Barco has been part of a number of installations – often for movie industry professionals – in the past following on from the manufacturer’s work in digital cinema. 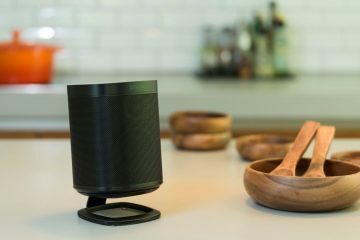 It quickly became obvious to Barco that it has a lot to offer for high-end residential applications, not just limited to luxury home theatres. 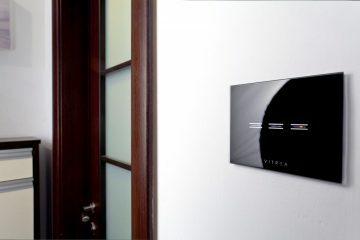 With Barco Residential, a new focus on image quality was born. “We are now putting specific focus on this, together with a select group of custom integration partners, that can deliver tailor made solutions that create unique experiences for our customers to share with their loved ones,” Tim explains. 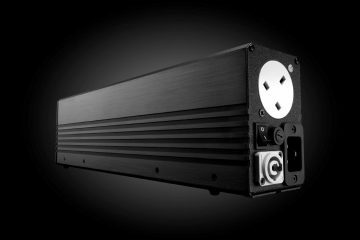 The Prometheus 4K projector is Barco’s current flagship projector for ultra-high end custom home theatres, built on the manufacturer’s know-how as a market leader in professional cinema and post-production projection, only customised to the high end home. Indeed, colour accuracy, uniformity, brightness and contrast are as important, and one could argue that everything needs to be in balance to experience content as the creator intended it. “The design and technology choices we make in building a projector are critical, and that’s why Barco Residential exclusively uses DLP technology coupled with the highest quality optics to achieve the best possible overall image quality,” Tim clarifies. True to its word, Barco Residential is introducing several innovations for this market, starting with its Orion and Optix Cinemascope projectors, featuring a new DLP chip (developed by Barco in partnership with Texas Instruments) that supports a resolution of 2,560 x 1,080 whilst providing native Cinemascope 2.37:1 images without the need for anamorphic lenses. According to Tim, this represents a 78% increase in pixel count over Full HD for Cinemascope content and the majority of feature films. Michael Bay being such a high profile client can only help draw attention to the residential side of Barco’s offering, potentially spearheading a new wave of business opportunities as the manufacturer is seen in a new light. Who pays £324 to rent a film using a fingerprint reader? Kimye does.